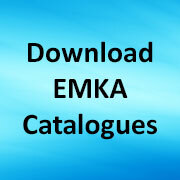 Our EMKA Group is known as the world leader for locking systems, hinges and gasketing in the areas of industry, electronics and transport and the Hannover Exhibition is our international shop window. At present, our product range comprises more than 15,000 components which are developed, manufactured, processed and assembled at eight production facilities in Germany, France, England, Spain, Bosnia and China. The company operates in 46 countries worldwide, employing more than 1,400 people. EMKA is an expert in casting of steel, aluminium and zinc, injection moulding of high-performance plastics and in the extrusion of rubber and plastic profiles. Manufacturing expertise is ensured by our own stamping, bending, turning, milling, coating and the final assembly of modular product solutions. Our experienced team of designers, developers and engineers is available for the production of individual customer projects, while overall the company sets standards for quality, manufacturing expertise and delivery performance. At Hannover you will be able to see the most recent products and trends in the enclosure hardware industry – we hope to see you there! Share the post "Why EMKA? Why Hannover?"